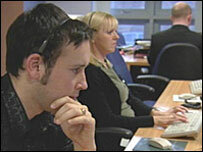 A campaign has been launched to attract workers to call centres in Glasgow and the west of Scotland. The Calling Scotland initiative plans to encourage further recruitment into what has been branded "one of Scotland's most important industries". The campaign has been developed by Scottish Enterprise Glasgow and is supported by local enterprise companies and several call centre employers. Jobs fairs, tours of call centres and advertising campaigns are all planned. There are currently 300 contact centres in Scotland, which employ 56,000 people, equating to one in 43 of the country's working population. Those behind the campaign say a major factor in the growth of the call centre industry in Scotland has been the quality and skills level of the workforce. A programme of awareness-raising events will run throughout the year. Gordon Maclennan, of Scottish Enterprise Glasgow, said: "Glasgow already plays host to more than 100 call and contact centres, with some of the world's leading companies across a wide range of range of business sectors having major operations in the city. "As the industry continues to expand, it is important that we do everything we can to further encourage people to work in the sector by spreading the word that it offers job opportunities for all types of people of a variety of ages and experience." The campaign also hopes to address concerns that employment in Scotland is threatened by offshoring of jobs to India and other territories. Mr Maclennan said: "The reality is that, while a number of companies have taken the outsourcing route for the provision of some services, this is having a minimal effect on the sector in Scotland and there is no evidence to suggest that this position will change in the future." However Hugh Scullion, regional officer with union Amicus - which represents the majority of call centre workers - warned that offshoring remained a very real threat to Scotland as a major financial centre. He told BBC Scotland's news website: "We have no problem with a responsible approach to offshoring like this but we are concerned that some of the forces driving the offshore phenomena do not take into account what the economy may look like in five or 10 years time. "While Glasgow has been relatively untouched by offshoring, over 2,000 jobs have left Scotland as part of 18,000 which have left the UK since 2003." But he backed the drive to encourage people to take up call centre jobs. Mr Scullion said: "This is an excellent initiative and it's exactly the kind of thing Amicus has been calling for for over a year. "The important thing to realise is that offshoring is not just about call centre jobs. There is no job out with construction and leisure that cannot be offshored." 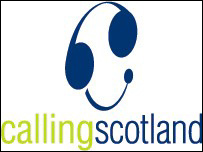 The Calling Scotland campaign is also being backed by the sector's professional body, the Call Centre Association (CCA) and has the support of key agencies including Careers Scotland and Jobcentre Plus. Anne Marie Forsyth, chief executive of CCA, said: "The perception of contact centres is one of low skilled activity. However, the reality is far removed from this. "It is vital that a new and vibrant workforce is continually available to meet the increasing demands of customer service across all our customer contact centre sectors. "This is vital, not only for front line service, but to provide the management structure for the future."